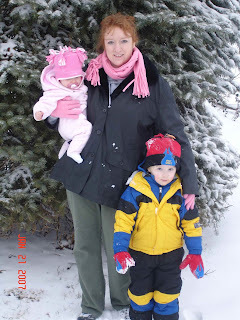 I really need to go to Walmart for diapers, but it is so cold outside! I really don't feel like taking the kids out in that. So, it is another day in the house. These are the days when it is hard for me to resist food! 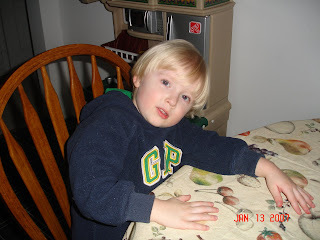 I am at home, not feeling well, and Jaden is driving me nuts! I used to grab a candy bar or cookies (or both!) to cure the boredom and mundane! Well, now, I have to get on the computer or start doing housework. 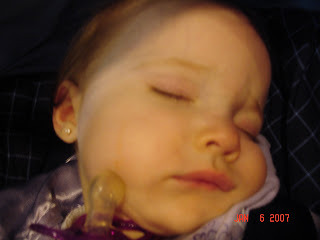 I also like to turn on some music and sing really loud, but Cassidy is still napping. Jaden only took an hour nap today. They seem to get shorter and shorter. Cassidy is getting really good at getting around a room. She even finds things on the floor for me (ie. peanut shells, paper, little rocks). I really need to start sweeping the floor every morning. I know that wouldn't solve it though! 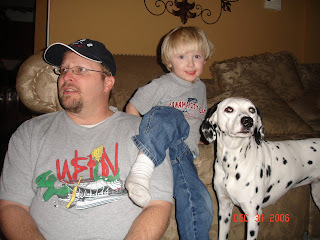 Jaden told Jeff this morning that it would be a good idea if he stayed home and helped him play games all day. How sweet! We had to try to explain to him that Daddy had to go to work. 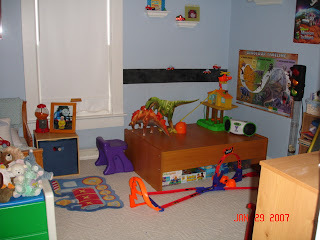 Tomorrow we are planning on putting a small tv in Jaden's room to play his video games on. Is this a good idea? I keep telling myself that it is okay because it's not "tv" it's video games. What does everyone else think? Please comment and let me know! By the way, if you are going to comment, also let me know what everyone thinks of Strawberry Shortcake! Thank you all for the prayers! They worked, Jeff fixed the faucets!!! Sick and cleaning the house! Well, I finally got it. I have Jaden's cold. It really hit me hard this morning! I did manage to get some cleaning done. 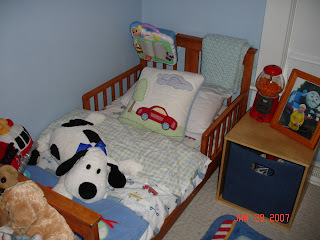 Jaden's room is clean, but that will only last a few hours! But, it feels good to clean it once in awhile! He doesn't like it clean. He always tells me he likes it messy! Typical kid! 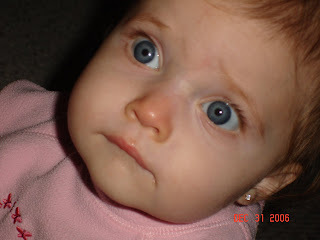 I have been busy planning Cassidy's first birthday party. Yes, it is 3 months away, but I can't wait! I need to prepare. I am planning on inviting family and yes, that means you guys in Ohio!!!! I will try to come up with a date soon, so you all have it well in advance. I hope you can come. I am going to make it very special for her. I hope everyone is enjoying the blog! I enjoy doing it! I haven't gotten any comments yet! Feel free to comment! I would love to hear from you! WATCH OUT! 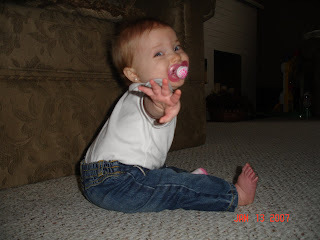 CASSIDY IS CRAWLING! We have a Pro Basketball player! We had a great time at basketball this morning! We had to be there at 8:40 for pictures! That is really early when you have an entire family to get ready before then! But, we made it just in time! Jaden got a picture taken with his teammates and one individual. We ordered a few pics and 2 buttons for Jeff and I to carry with us everywhere! I am hoping they turn out well. Jaden can't ever act normal in front of a camera, so we will see! His game went well. He even made the last shot of the game! He seemed so proud of himself. I think next week is his last game! It is kind of sad. I am hoping soccer will start in early spring! Cassidy woke with a runny nose. I am afraid she might be getting sick. It might just be from teething. Not sure! Jeff is off to work and I plan on going to the grocery store. All is well for today. Jeff asked if we were going to Cincinnati tomorrow, but I told him he HAD to fix the water faucet in our house! It is like Chinese Water Torture here! Please pray that he will be able to fix it (hehehe)! It has been a pretty quiet morning this morning. Jaden has been great! 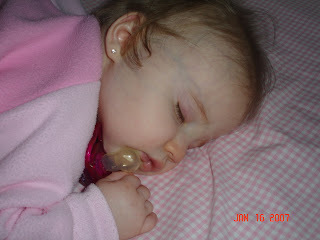 Cassidy took a nap and I got to talk on the phone for awhile with no interruptions! That hardly ever happens! So, I am feeling very stress free right now. I think I will try to clean the house. It is always a mess after Jeff has been off a couple of days. I just don't get much done when he is home! Jaden is playing with his Imaginext castle right now. He loves that thing. He also loves the Backyardigans right now! I don't know if many of you know what they are, but they have a show on Nick Jr. They are these cute little animated animals. We like them too. We bought him a DVD of them and he has probably already watch it ten times in the last few days! He loves it. So, right now, he can't get enough of the Backyardigans. Cassidy is STILL trying to crawl. She comes so close! I know she will do it soon. Be watching for that post!!!! I found out today that the Diego show is coming to Indy in February. I would love to take Jaden, but those ticket prices are crazy! Maybe we will wait for something else! Hey everyone in Ohio, we have been talking about coming there soon. Jeff never gives advance notice, so I wanted everyone to know we will be heading that way soon. I will try to let you all know the exact day when Jeff decides he wants to go. It will be interesting to see how the kids will do for that long drive! Cassidy doesn't like to sit in one place for too long. Should be interesting!! Can't wait to see you all! By the way, I keep updating that thing on the right side with pictures of my scrapbook pages. I just wanted to let everyone know again! It is fun putting those on there for everyone to see! Jeff and Jaden are off to the big hill again! 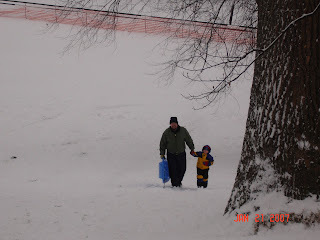 It snowed a little more last night and Jeff thought it would be good for Jaden to go sledding again! Jaden's nose is a little runny, but he doesn't have a fever. So, I said "Go for it!". Cassidy is now napping and it is very peaceful in here (except for Rosie griping on The View about the president!). I think I will be turning the tv off now. I am going to try to scrapbook today since Jeff is home. Be looking for a new scrapbook page over to the right soon! 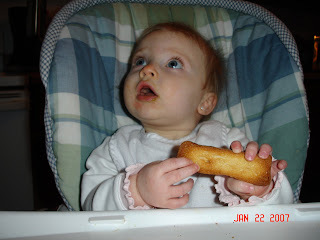 Cassidy tried her first finger food last night! We gave her one of those zwieback toast things! She played with it more than anything! She even played with another one today. She will be eating them better soon though! We noticed a new tooth today! 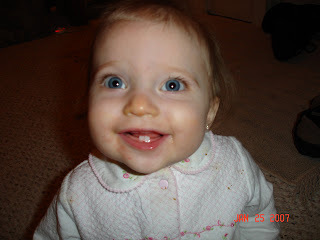 Her upper front left tooth is out! (If you click on the bottom picture you will see her tooth in the big picture!) How exciting. I really love her two bottom teeth. 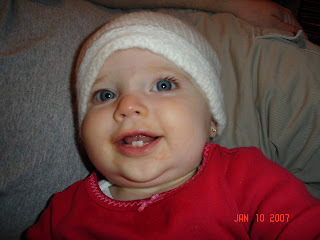 I will miss those cute gummy smiles of hers! We took Jaden to the library today. He loves doing puzzles there! I noticed his nose was a little runny and he was sneezing a little more than usual. So, I suspect we will wake to a sick kid in the morning! 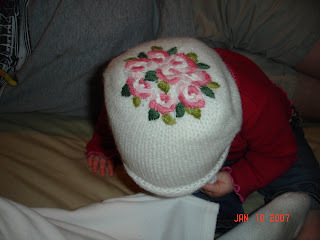 Okay, so I probably got some of you excited by the title of this post, but Cassidy is NOT crawling quite yet. She is so close! She gets on her hands and knees and then falls down. I think she could do it if she really tried. I can't wait, but I also can. That is going to mean to much trouble for Jaden!!! I don't know how he is going to handle Cassidy getting into his stuff! Jaden has been hectic today. I went to Hobby Lobby and he was not very good there. I have him down for a nap now, boy did I need that nap! I think I need his naptime more than he does! Cassidy is crying now because she can't seem to stay laying down in her bed anymore! She always sits up and doesn't sleep!!! It finally snowed! How exciting! We woke up and told Jaden to go look out his window to see if it snowed. He came back and said "It did KNOW!". It is so cute how he says snow. 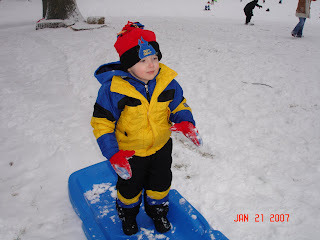 So, we told him to get bundled up and we would head out to the big hill at the park. So, we did!! They are outside building a snowman now! I am so excited that it finally decided to snow. We love it!! Cassidy is over at Grandma and Papa's. We will be picking her up soon. I can't wait until next year when she can play in it also. Another Saturday... Another Basketball Game! Jaden had his basketball game this morning at 9:45. We were happy to see Grandma and Papa Chamberlain there! Jaden was too! He played the game great! Probably the best he has yet! He even made a basket. I think he was happy that his coach was back. He had been gone with bronchitus the last few times. He ran straight to him when we first got there. They are getting their team pictures taken next Saturday. If any of you would like a picture or magnet or something, let me know! I am hoping for a really cute picture!! They sell magnets, pins, posters, and pictures. Just email me or comment on here if you would like one. 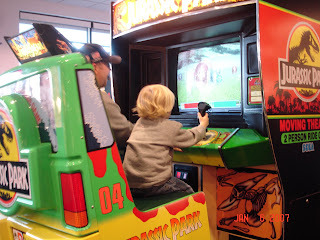 We went to Mcdonald's afterward and let Jaden play in the Playland area. He made another friend. This time he got his name... Jacob. That is all we heard the whole time he played. He kept calling out for Jacob. So cute how he makes friends so easily. He even asks God to bless them every night when he goes to bed. Tonight, we had to ask God to bless Jacob, hehehe. 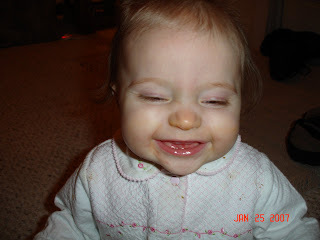 I found out about a baby picture contest from one of my magazines. I think I am going to enter Cassidy. I just have to get a really cute picture of her. (That shouldn't be too hard). If anything comes of it, I will let you all know! My Babies Are Growing Up!!! On our way home I decided to stop at Toys R Us. I planned on just going in to browse, but I found the coolest thing! We have been looking for a booster seat for Jaden but I didn't want a plain, boring one! Well, I found the perfect one! Check it out! 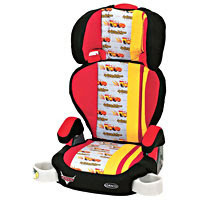 If you can't tell, it has Lightning McQueen on it! Very cool. Jaden wasn't so sure about it. He liked it until he had to sit in it on the way home! He cried the whole way. 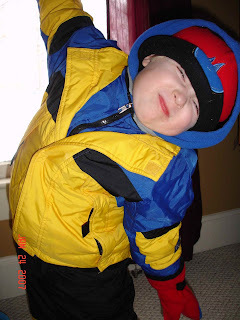 My son doesn't like change! 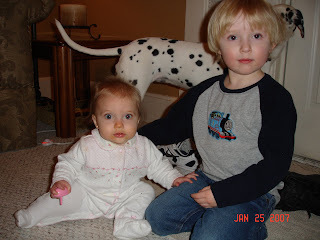 So, all of the events today have me thinking "My kids are growing up!". How sad. I wish I could just keep them small. 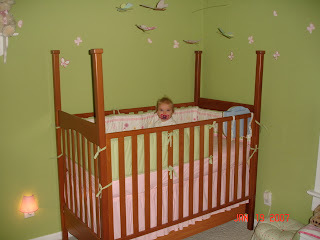 As I was going in to get Cassidy out of bed this morning, she was sitting up!! I saw her little head peeking over the edge. How sweet!! And how sad. She is growing so fast! I ran and got my camera so I could post it on here. I hope everyone enjoys the picture. Today, we are off to Bogey's Family Fun Center. 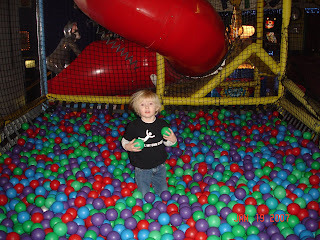 Most of you know that that is where Jaden had his first birthday party. Well, I figure he will really enjoy it now, so I am taking him there. I can't wait. I hope he has a lot of fun. I will hopefully update with some pictures tonight! 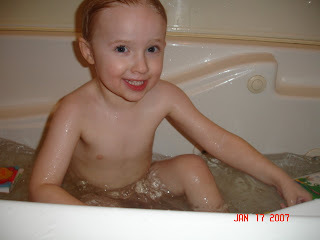 Jaden never wants to take his bath, but once he gets in there he doesn't want out. He loves playing in there. We got him a "bathketball" goal, hehehe. It is so cute. He loves to take turns, with whoever is giving him a bath, to make a basket! Jaden had a late bath last night. He stayed up waiting on Jeff to get home and to eat his chocolate popcorn. He was so happy when Jeff came home at 9:30. Jaden didn't get to bed until around 10:30 and he didn't fall asleep until after 11! He was a good boy though. Cassidy is in a rather grumpy mood today. I don't know what her problem is. It sure is driving me crazy!! Maybe she will be happier after her nap! Okay, so I think I have told everyone about the GREAT coffee maker Jeff got me for Christmas! If not, I will let you know. It is called the Flavia. You can see it at www.MyFlavia.com. Anyway, I love this thing. I have had Hot Cocoa and Cappuccino every night! 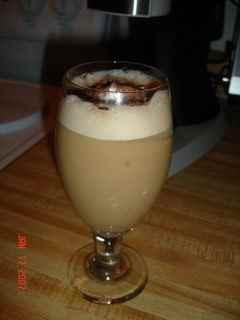 Tonight I am even having an Iced Cappuccino. Anyway, I just love this stuff! Hope it doesn't keep me up all night!! Goodnight everyone! Jeff has a meeting today in Chicago, so we are not expecting him home until late tonight. Jaden and I made him some chocolate covered popcorn. He has been craving that, so it will be a nice surprise for him when he gets home! Jaden even said he wanted to wait until Daddy gets home to eat it! It's so sweet. I thought for sure he would eat some, but he hasn't yet! I put some of Cassidy's clothes on ebay. 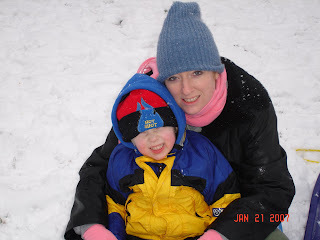 It is usually very hard, but it doesn't seem as hard with Cassidy as it was with Jaden. I really don't know why that is! I think I am just in the mood to clear out the house and have everything organized. Her closet and dresser are stuffed with clothes that do not fit her. I finally cleaned out my closet. Now I have to get rid of the clothes that don't fit me! 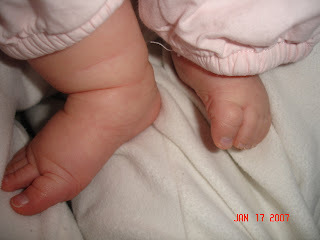 Why are baby feet so cute? I think I have taken over a hundred pictures of Cassidy's feet! Is this normal? I know that I will miss those little feet one day, so I am trying to take as many pictures as possible. 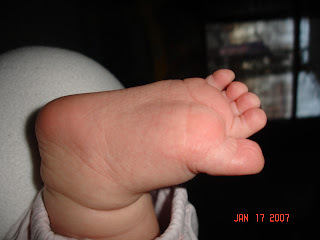 If you love baby feet, here are a few pictures!!!! Aren't they just kissable???? 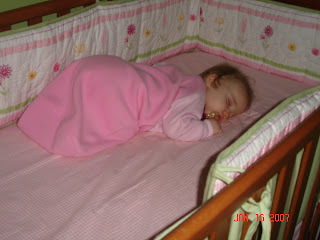 Oh, and for those who love sleeping babies, here are a few pictures of Cassidy in her bed last night! My mother mentioned that I didn't have anything about scrapbooking on my page. I was only going to make my blog about the kids. 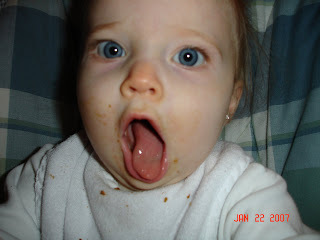 But, now that I think about it, my scrapbook pages are of the kids! So, I am going to start posting my scrapbook pages on the right side of the page! Jeff is off today, but he had a couple of conference calls, so he is really still working! He went to get his haircut and took Jaden with him. Cassidy is still napping. She is learning to stick her tongue out now. 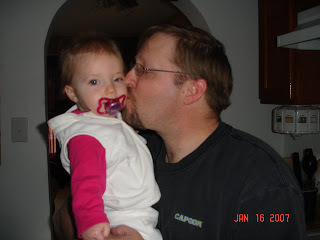 I am sure I look like a dork, sticking my tongue out at her all of the time! 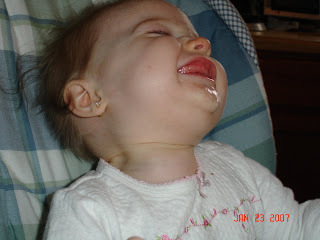 But it is soooo cute to see that little tongue poke out and to see how excited she gets when she does it! Cute! Not too much going on today. Jaden had a friend over last night and I made supper for them. I think Jaden had a great time! They ran around the house playing with chalk, cars, planes, toy food, you name it, they played it! Very cute! Cassidy just sat in amazement. I am sure she is taking it all in and will be walking soon! Jaden had basketball this morning and he did great! He didn't make any baskets during the game, but he did play all the way through without complaining. Jeff actually went out and coached a little. It was fun. We would like to invite everyone to come watch him next Saturday at 9:45 am. He is going to be playing at the Wabash Valley Sports Center. I hope you can make it. He is doing well. I love taking pictures of Cassidy. Yesterday, she was especially funny! She is always in a good mood when Daddy comes home and we are all sitting down to eat. 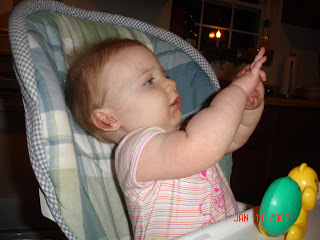 She clapped for the first time yesterday. Here are a few funny pictures! Clearance racks and Baby Girl Clothes! I also found a few good clothes for me at the Gap! Their clearance sales are the best! I don't think I ever buy clothes full price. That is a good thing, since I am buying a whole new wardrobe for the smaller me. Jaden had fun at the mall. He ran around everywhere. He likes to run on the other side of the mall aisle, I guess it makes him feel independent! He always keeps his eyes on me though. He is very afraid of losing me. Which, is a good thing. Today is just another day in the nut house! It's really not a nut house today. Jaden has been playing on the computer and watching tv. Cassidy is now down for her morning nap. It only lasts 45 minutes. 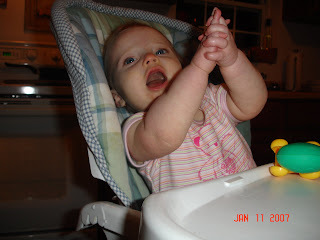 I try to blog or clean up her messes during that time while constantly telling Jaden "Shhhh". He is getting good at being quiet while she sleeps. I don't have much planned this week for the kids. It is now too cold for the park or to play outside. I will have to come up with some creative ideas for inside. How are your New Year's resolutions going? I don't really have any. I made mine the middle of last year and that was to lose weight. I am so happy I followed through with that one!! I bought another size smaller pants yesterday! What a feeling!!!! 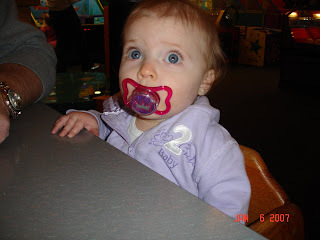 A Day Out at Chuck E. Cheese's! We always look forward to AND dread Saturday mornings when it is time for basketball. Jaden always acts goofy at basketball and we are always praying he will play right. Well, this Saturday he acted goofy! He even made his coach fall! Jaden runs around like a mad boy and doesn't pay any attention to anything! So, this time he was running and the coach turned around, as he was heading to the other end of the court, and BAM! There was Jaden! Hehehe. He tripped over him and fell. Pretty funny. Jaden had fun and really, that is all that matters. Afterward, Jeff was hoping not to have to go into work today. Turns out, he didn't. He has a super long week next week! 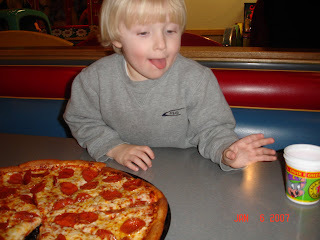 We ended up going to Chuck E. Cheese's. Jaden has been begging to go and we wanted him to get out of the house and have some fun. And he did! We ordered a pizza and Jaden got 90 tokens to play games. And if you don't know, that is 90 GAMES! 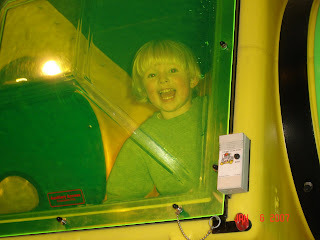 Jaden's favorite thing was what I call a "Human Hamster Tube"! 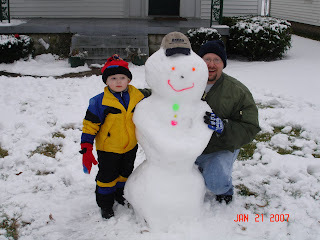 He loved that thing! He even worked up a sweat!! I haven't seen him smile that big in a long time! Cassidy also had a first there. 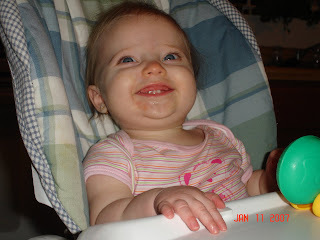 She sat in a restaurant high chair for the first time! She looked so cute. She loved it. She did get tired and fell asleep while Jaden played his heart out! All in all, it was a great day. Here are a few more CUTE pictures. Can you believe we went to the park yesterday in the middle of winter! It was 50 degrees!! It was nice seeing Jaden running around sliding down slides and climbing! Cassidy pretty much sat in her stroller and watched. It was a bit chilly so we ended up leaving a little earlier than expected. I wanted to take some pictures, but I had left my camera at my parent's house. 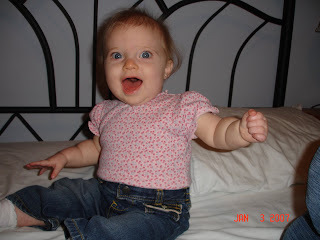 Here are a few pictures of Cassidy at 8 months! 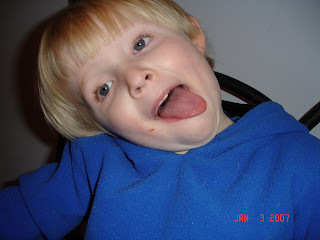 And here is Jaden being, what else, a nut! I am so excited about this blog! I hope to keep everyone informed on the kids and to keep many pictures posted! Here is a little update! I am now 50 pounds lighter than I was before I got pregnant with Cassidy. So the 50 is not even counting the weight I gained with her! I am feeling so much better and more energetic. I do feel a little fat today due to the holidays, but I was happy to see the scale showing a loss of another couple of pounds! What a way to start the new year! Jeff is still working in Lafayette. We are hoping he can find something closer this year. Maybe we can even find a way to buy a house! That would be a dream come true. Jaden is busy as ever! He got a castle from Santa Claus and he plays with it all day! He got so many toys. It is nice that he is so busy now! Thanks everyone who got him gifts! He (and I) really appreciate it! 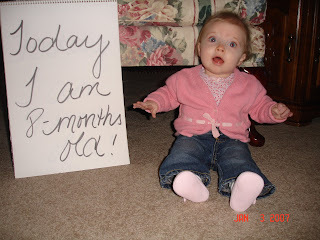 Cassidy is 8 months today and she is almost crawling! She is trying so hard! Her vocabulary consists of "RaRaRa" and "BlahBlah". Pretty cute. 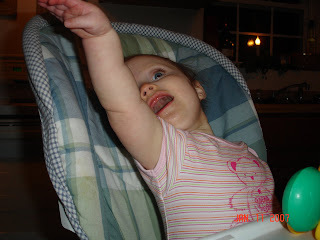 She is also waving and playing peekaboo with her hands. That is adorable. I hope you all will see her soon. As for now, here are a couple of pics!